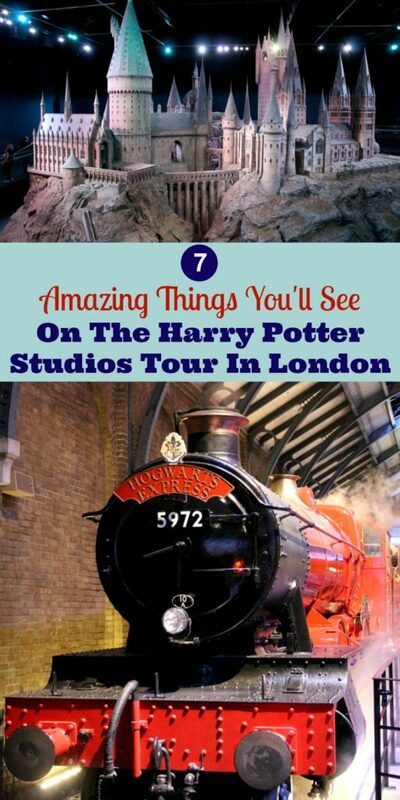 Planning a trip to London? 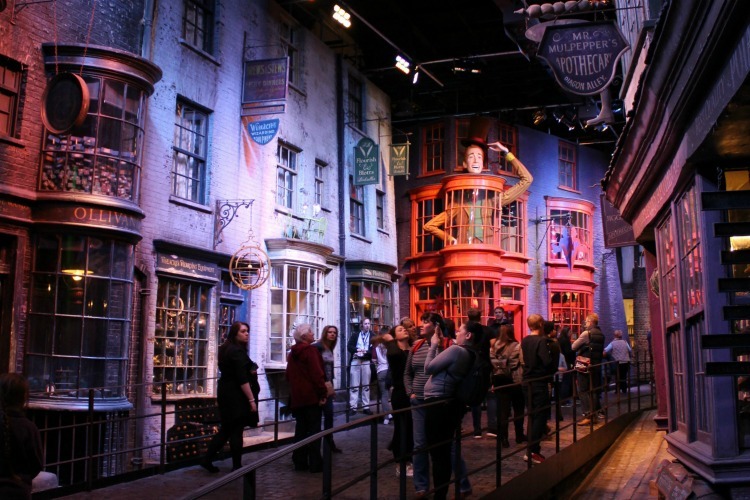 The Harry Potter Studios Tour might not be the first attraction that comes to mind, but it’s definitely one that you should consider adding to your must-see list. 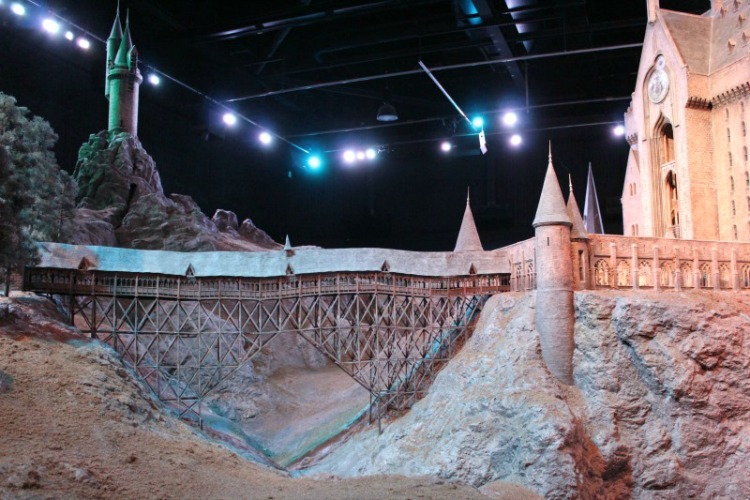 From actual movie sets and props to the magic of special effects, there’s no shortage of amazing things to see. And you don’t even have to be a Harry Potter fan to enjoy them. When I booked a trip to London, I made plans to revisit traditional attractions like Big Ben and The Tower Of London. I also planned to see lots of musicals in the West End. 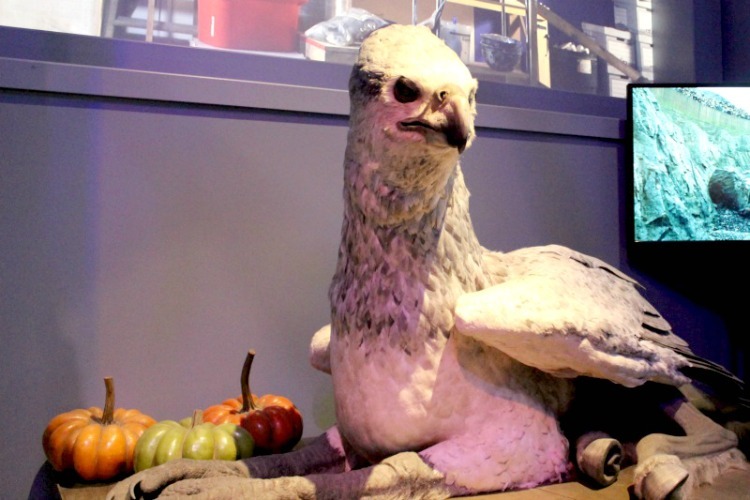 The Harry Potter Studios Tour wasn’t even on my radar until I saw something about it online. At the time, I hadn’t read any of the Harry Potter books and had only seen about half of the first movie. However, I was staying with family and I knew my nephews would love it. Taking the boys and my sister-in-law seemed like a great way to say thanks for putting me up (or putting up with me). I knew my nephews would have a great time, but I didn’t expect to love it as much as I did. 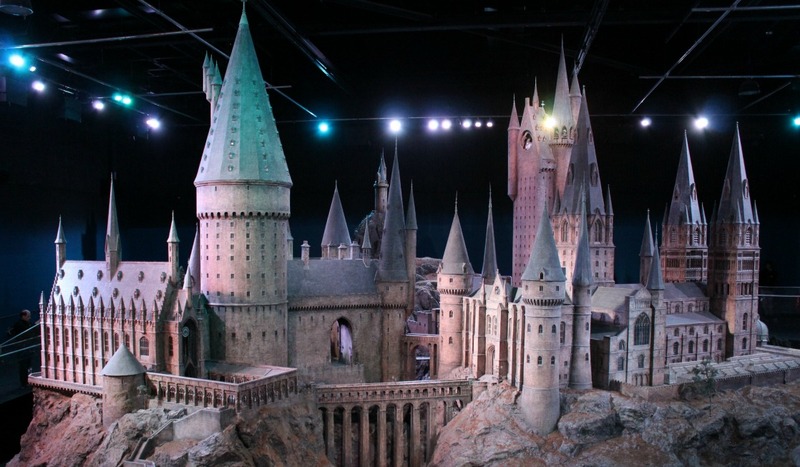 I discovered that the Harry Potter Studios Tour is not just for the die hard fans, but for anyone that loves pop culture, movies and getting a behind the scenes look at it all. These are the some of the things I enjoyed most. Unlike Harry Potter World at Universal Studios, this is where you’ll see the actual sets used in the movie. 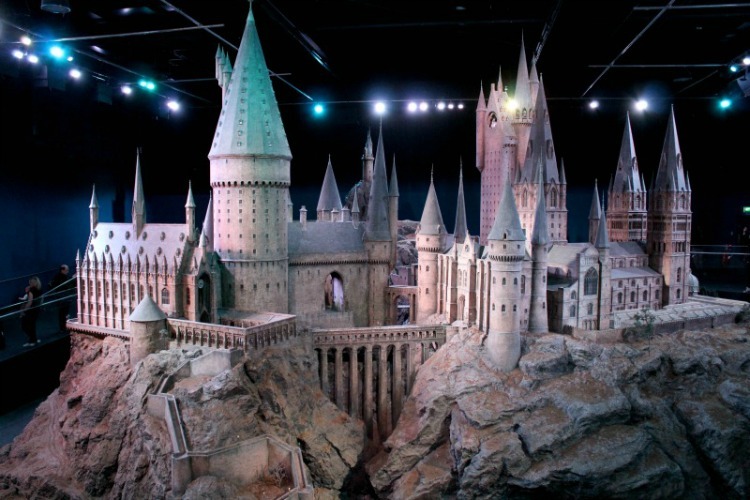 The studio tour takes place next to the sound stage where all eight Harry Potter movies were filmed. When we began our tour in the main hall, it was a bit surreal. 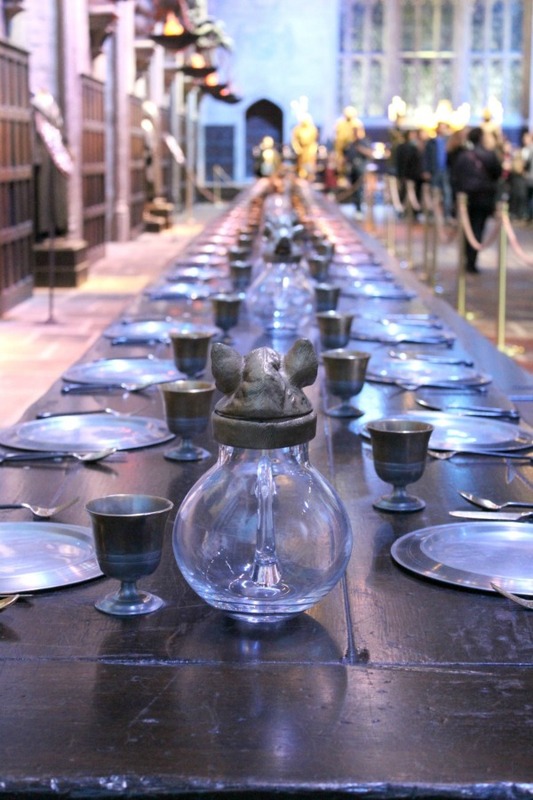 We saw the costumes, the sorting hat and long tables complete with place settings. These are the same place settings that Harry and his friends ate from in the movie. There were quite a few sets on display throughout the tour. We saw Harry Potter’s bedroom, the common room, Dumbledore’s office and many more. With curvy road and whimsical buildings, walking through Diagon Alley made me feel like I’d been transported into Harry’s world. This was one of my favorites sets and one of the few we could actually walk through. 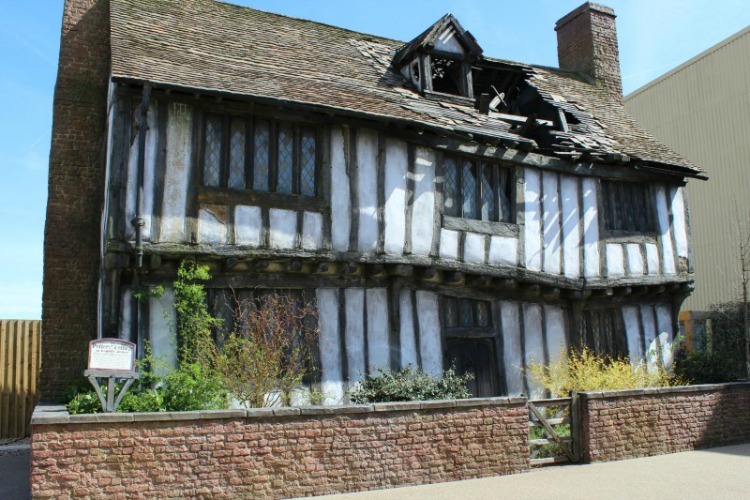 There were also larger sets outside, such as the house on Privet Drive and the house where Harry lived with his parents as a baby. 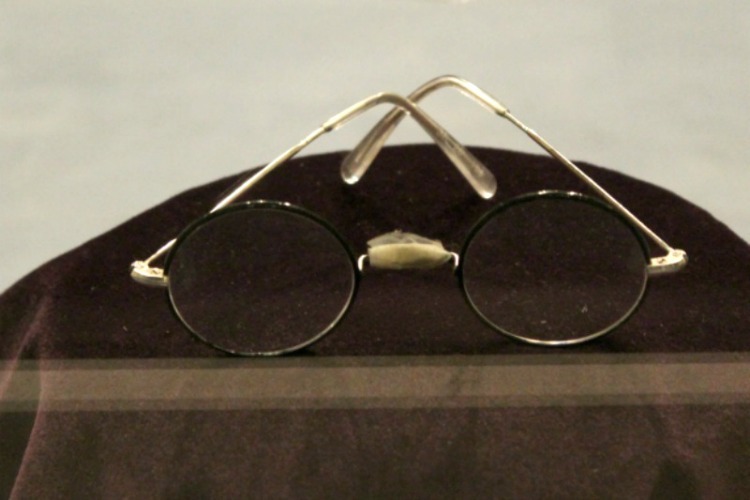 I thought it was pretty cool to see Harry Potter’s iconic glasses in person! Before we hit the outdoor part of the tour, we were guided through the dining area and stopped for lunch. 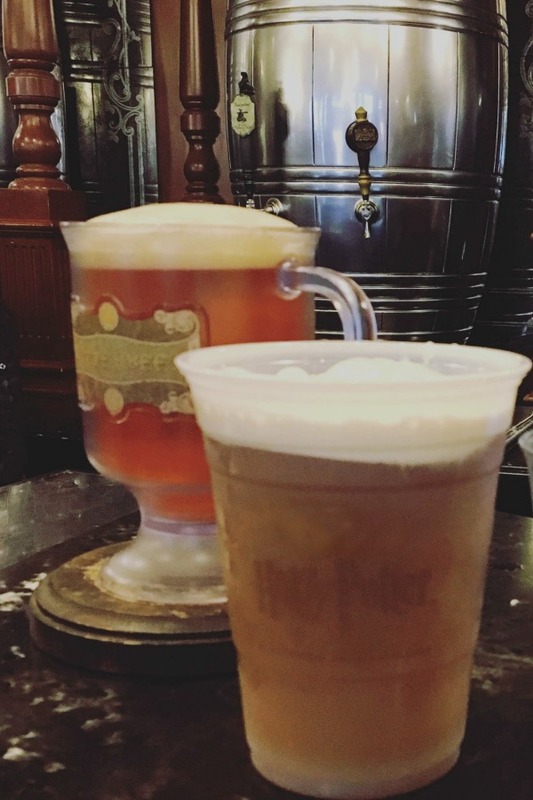 Of course, lunch at the Harry Potter Studios wouldn’t be complete without a glass of butterbeer. 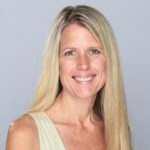 We decided to share one, which turned out to be a smart move. I thought it was a little too sweet and didn’t really like it and my sister-in-law felt the same way. That was totally fine with the boys because that meant more butterbeer for them. Seeing the Hogwarts Express up close was pretty amazing and the 78 year old engine looked like it might just leave the station at any minute. Not only did we see it from the outside, we were able to walk through where some of the interior movie scenes were shot. There’s also a section where we sat and looked out the “window” to see chocolate frogs and flying cars outside. We were really just looking at a TV screen but my nephews still got a kick out of it. 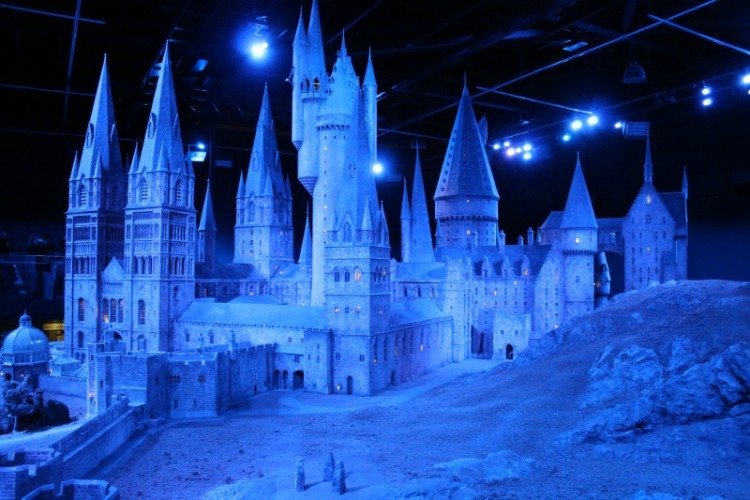 There were obviously lots of special effect used in the movie so this part of the tour was pretty interesting. The hippogriff was there and it was fascinating to watch his movements. He almost looked as if he were actually alive. Ever wanted to navigate a Nimbus 2000? If we’d wanted to pay a little extra, we could have made videos of ourselves flying a broomstick in front of a green screen. I didn’t do this but it looked like so much fun that I may just have to try it next time. 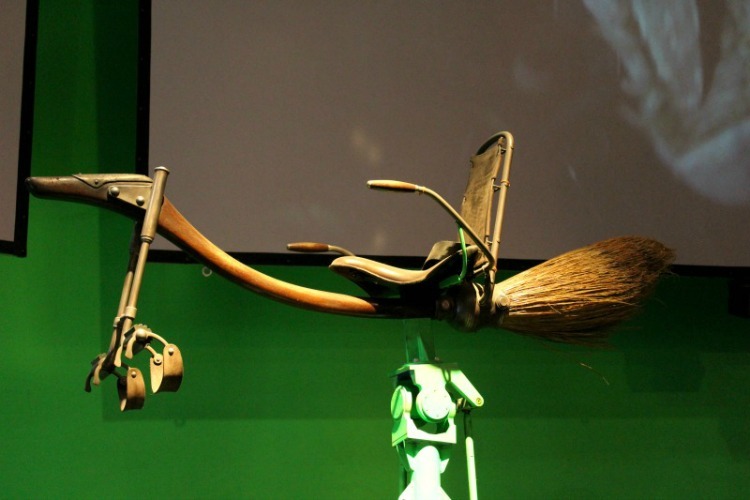 After all, how many chances do you get in life to ride a broomstick? This is the grand finale and one of the most awe-inspiring parts of the tour. 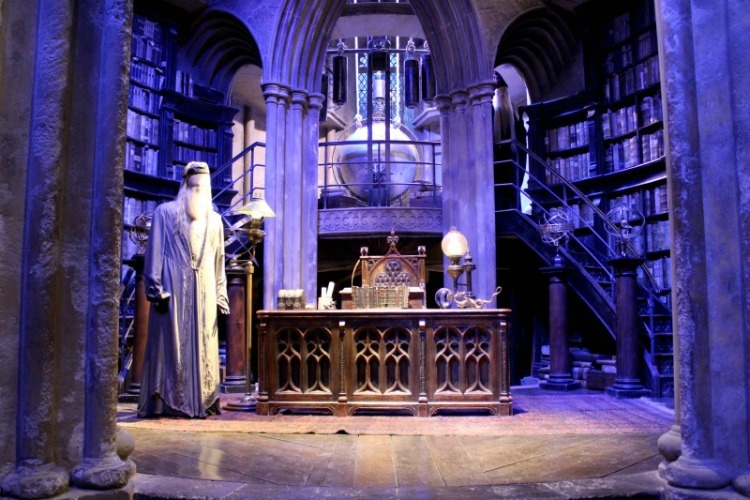 The Hogwarts replica was my absolute favorite part of the tour. They made this 1:24 scale model for the first film and digital enhancements make the courtyard, turrets and tower look more realistic in the film. However, we thought it was pretty amazing on it’s own. To get a better feel for the sheer size of it, just check out the people standing off to the side. Every so often the lights would dim and Hogwarts was lit with simulated torches, lanterns and other lighting. It really was beautiful! Normally I wouldn’t include a gift shop on a list of favorites but this one was pretty awesome. My nephews thought they had died and gone to Harry Potter Heaven with Chocolate Frogs and Bertie Botts Every Flavour Beans. 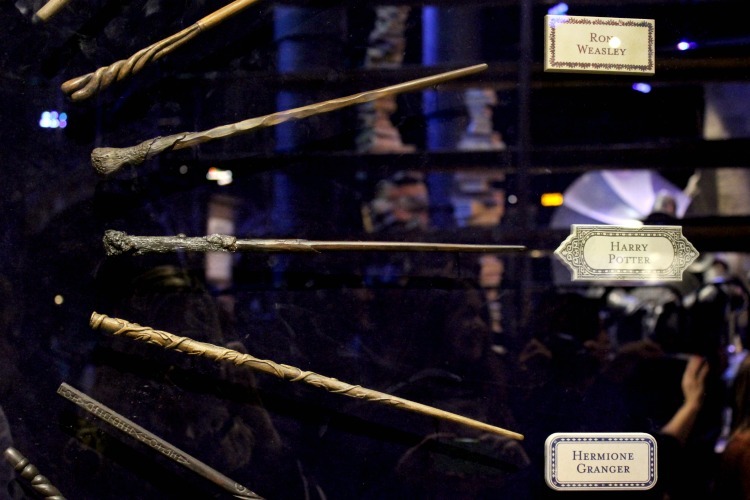 The highlight for them was taking home a replica of a magic wand used in the movie. I was impressed that it wasn’t just a cheap, plastic copy. The wand was well made and sturdy enough to survive two very active boys. 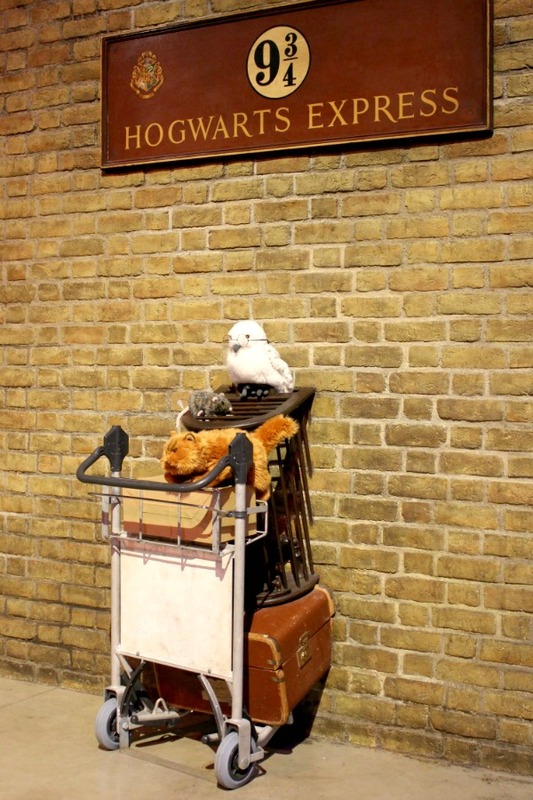 Though I wasn’t a Harry Potter fan before visiting the studios, it turned out that I knew more about Harry Potter than I thought. I was surprised at just how much I loved this tour. If you’re planning a London vacation, go ahead and book that The Tower Of London visit. 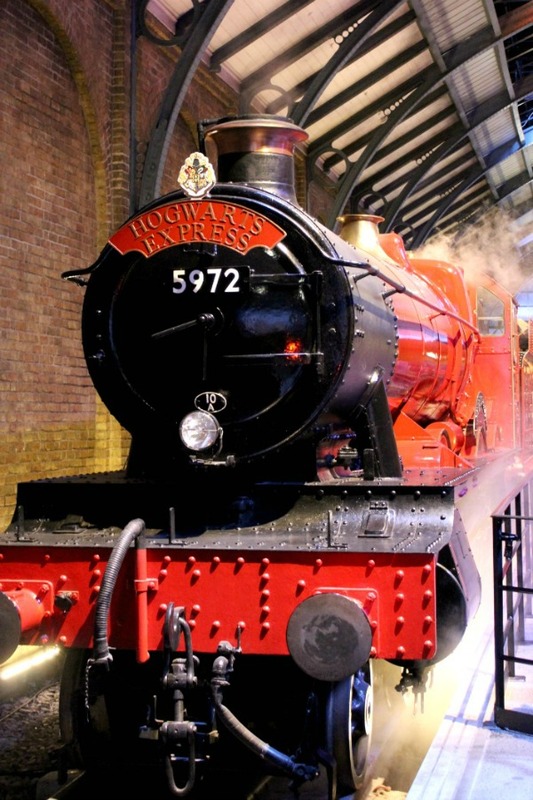 You just may want to consider adding the Harry Potter Studios Tour to your itinerary too!